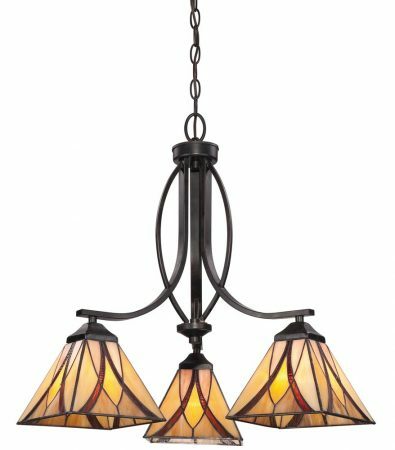 This Quoizel Asheville 3 light chandelier with Tiffany shades in Art Nouveau style and valiant bronze finish boasts a beautiful colour palette of mottled desert sands, fiery rippled red and earthy tones. A detailed curvaceous frame and chain suspension finished in rich valiant bronze completes the stunning look. Featuring ceiling mount and chain suspension, with three flowing square section arms supporting the shades and braced by outer curved bars. 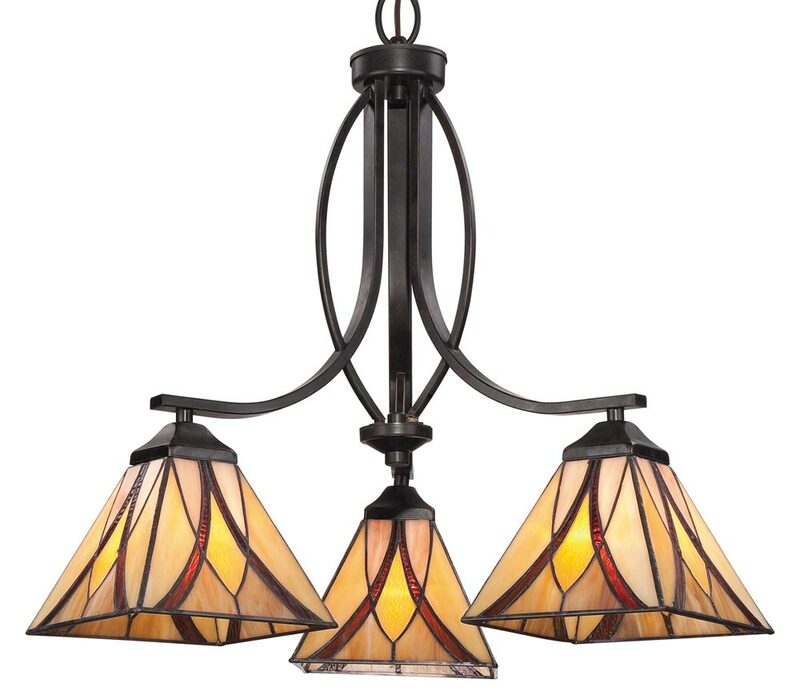 Three wonderful Tiffany shades contain separate pieces of high quality art glass in a typical linear Art Nouveau design, with flowing curves in shades of amber, cream and russet tones, highlighted with fiery rippled glass panels that will sparkle like jewels when illuminated. Art Nouveau style at its finest, this Asheville chandelier is skilfully arranged and features the very best in craftsmanship. The geometric pattern and vibrant colours are achieved by skilled artisans using separate hand-cut pieces of art glass, which are copper foiled and hand-soldered to create this stunning shade. The hand-crafted Tiffany style shade features a classic design, with a beautiful colour palette which creates a warm and inviting atmosphere. The valiant bronze finish adds to the authentic look making it ideal for both traditional or contemporary styled spaces and perfect for any living room, dining room or hallway ceiling. The Tiffany shades are hand-soldered using traditional techniques that have been used for centuries. The colours may differ slightly from the image shown as each piece of glass is hand-made and may differ slightly in hue or shade. This should not be seen as a fault, rather something that makes each Tiffany shade unique. Supplied with 150cm of chain suspension that can be shortened by removing links to achieve the perfect drop, please see below for dimensions. This stunning design is supplied by Elstead Lighting and designed in the USA by Quoizel, founded in 1930 in New York. Their designs embody a history of being artisans in glass and natural materials that illuminate your living space and enhance the beauty of your home, such as the Asheville 3 light chandelier with Tiffany shades in Art Nouveau style and valiant bronze finish featured here.